It's the first PPV of the month, after a string of strong Raws as of late, can WWE present an improvement on last month's Extreme Rules offering? Let's have a look at the card. Rollins - 2 wins, 0 losses. Similar to last month's Steel Cage main event between Seth Rollins and Randy Orton, this is all going to be about how much Kane and J&J Security get involved. As a straight up Fatal Fourway there's potential to put together an entertaining encounter with some cool spots and false finishes, tied together with fast paced action involving all four men. There's the obvious tension between each man that have been played up on the last few weeks of Raw, as well as the fact that all three members of The Shield are present in the bout, which has the potential to provide enough storyline nourishment to keep things interesting. However, the face and heel dynamic would seem to call for plenty of interference from The Authority, while the added stipulation that Kane will be removed as Director of Operations if Rollins fails to retain the title surely means we'll see the Scotch egg-esque Demon get involved. For me, Rollins and Reigns look like the most likely to walk out with the title, with it being just enough time since WrestleMania to delay Reigns title win to. However, Rollins has to be the favourite to win, having been impressive in his title reigns thus far and still with different avenues to explore over the next few months with the title. Promoted from last month's Pre-Show, this is perhaps the most difficult to call match on the card (with some bookies even offering exactly the same odds for both men). Neville has breathed some fresh air into WWE's mid-card, mixing things up with a number of different opponents on television, I'd expect him to do the same on his first pay-per-view encounter. We've seen that he and Barrett have chemistry in the ring, in their previous encounters and I'd expect this two be a similar display, based around Barrett trying to ground Neville. Barrett has momentum heading out of his King of the Ring win, but I have a feeling we'll see Neville pick up the victory to stake a claim for a place in the Elimination Chamber bout for the Intercontinental Championship on 31st May. Ziggler - 0 wins, 1 loss. Sheamus - 1 win, 0 losses. After making the most out of an uninteresting "Kiss Me Arse" gimmick, Ziggler and Sheamus get another shot at things this month. Their feud has heated up rather nicely across the last three weeks of television, with their pull apart brawl at King of the Ring showing exactly what the pair could do when given the time and space to build a rivarly. I'm hoping for something a little more competitive than at Extreme Rules and hopefully the match will be afforded a little more time to allow this to happen. It's almost a given that Sheamus will pick up the win here, due to WWE's even-steven booking, but I'd expect some underhanded tactics on the way to victory, with both men moving into the Elimination Chamber for the Intercontinental title in two weeks time. John Cena's last two opponents at Payback square off in a match that is happening on this show. 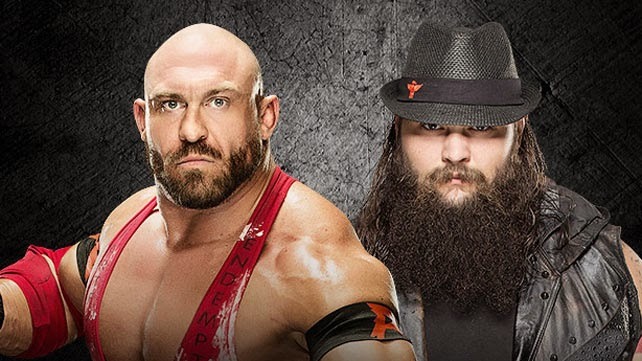 Wyatt doesn't like Ryback for some reason, whilst Ryback is hungry and interested in eating some buzzards. I think, that's right. I hope that these two pull something out and prove that they deserve a spot on the upper mid card, but I can't say I'm particularly interested in what has been put together throughout their feud. The possibility of a re-united Wyatt Family, with Rowan recently turning to join Luke Harper, could make things interesting, although would be WWE admitting they were wrong to break the group up in the first place a few months ago. Cesaro - 0 wins, 1 loss. Kingston - 0 wins, 1 draw, 1 loss. Big E - 0 wins, 1 loss. The New Day have been a revelation since their natural heel turn last month, putting in some good work on the microphone and in backstage skits, turning themselves into one of the most over acts on the roster, which gives this match a little something extra thanks to the fan involvement. All four men in the bout have the potential to build on their strong match at Extreme Rules, with the Two out of Three Falls gimmick offering plenty of space for creativity in terms of finishes and storytelling. There's a possibility that this could steal the show. Prediction - Kingston & Big E retain. This feud was dead for me following WrestleMania, it was then buried with the poor Russian Chain match last month, this "I Quit" match attempts to to dig it up and give it the kiss of life. The two will have to show more imagination than they did with their Extreme Rules match to really make this one work, with the "I Quit" gimmick offering itself for some interesting situations, clashing with Cena's "Never Give Up" attitude. I'm fully expecting to see a finish that involves Lana in some way, to finally end her partnership with Rusev, which has been teased as coming to an end for some time now. I wouldn't be surprised to see Cena win and drop the title the next night either. The third Diva's tag team match in five months on Pay-per-view, and this one does absolutely nothing for me. The Bella Twins as babyface just shouldn't be a thing, I'm not even sure how they turned, they just did, because WWE. More words. More words. More words. Tamina and Naomi win. Prediction - Tamina and Naomi win. There's some interesting looking clashes across the card, with a pair of intriguing singles matches in Ziggler vs. Sheamus and Neville vs. Barrett offering four men a good opportunity to prove why they deserve move up the card, whilst the Two out of Three Falls Tag Team bout also has potential to break away from the pack and produce a creative and entertaining match. The main event hinges on the amount of over-booking WWE chooses to put onto it, with last month's Extreme Rules main event being smothered in it's closing stages. Everything else does very little for me, so here's hoping that the four matches mentioned delivery on their promises. Enjoy the show, boys and girls.